VOXBONE - WebRTC: the Next Big Growth Phase of IP Communications? BROADBAND FORUM - What’s Next for Broadband? 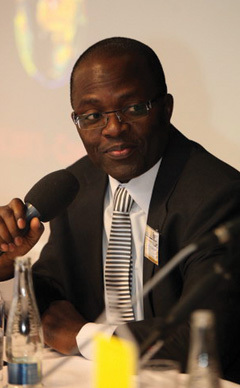 Dr. Cosmas Zavazava, Ph.D., works in the Telecommunication Development Bureau of the ITU. He is a widely quoted and passionate author on emergency telecommunications, climate change and sustainable development through information and communication technologies. Since 2001, Dr. Zavazava has been leading ITU’s work in saving lives through the use of information and communication technologies. He designed and deployed ICT solutions for disaster risk reduction, early warning, disaster response and sustainable development across the globe. He has a track record in fund raising and has been in many disaster areas deploying and restoring telecommunication networks, with the most recent ones being in Haiti and Philippines. The systems were used for search and rescue, coordination of humanitarian logistics and provision of telemedicine facilities for medical experts to attend to disaster victims. He has also designed National Emergency Telecommunication Plans for use by countries. He has spoken at many international conferences, with the most recent being the Fourth United Nations Conference on Least Developed Countries that was held in Istanbul, Turkey in May 2011, and the Third United Nations Conference on Small Island Developing States held in Apia, Samoa in August 2014. Dr. Zavazava was recently actively contributing to the ITU World Telecommunication Development Conference that was held in Dubai, United Arab Emirates in March –April 2014. Q: With the ITU working in the developing world how are new technologies helping to deliver service and bridge the digital divide, or is the divide getting bigger? A: New technologies are helping the world to get more and more connected. Almost three billion people will be online by the end of 2014. While the number of fixed-telephone subscriptions has been stagnating over the past decade or more, mobile-cellular subscriptions have continued to grow, especially in developing countries and by end of 2014, there will be seven billion mobile-cellular subscriptions globally. Broadband is emerging as technology of choice with 2.3 billion people becoming users. Almost all countries in the world have launched at least third-generation (3G) mobile-broadband services, and the number of subscriptions per 100 inhabitants, almost double the penetration rate in 2011. By the end of 2014 mobile broadband penetration will reach 32% - almost double the penetration rate just three years earlier (2011) and four times as high as five years earlier (2009). In developed countries, mobile-broadband penetration will reach 84%, a level four times as high as in developing countries (21%). Today, mobile broadband has become the fastest growing market segment, with continuous double-digit growth rates in 2014. Mobile broadband is growing fastest in developing countries, where 2013-2014 growth rates are twice as high as in developed countries (26% compared with 11.5%). All regions continue to show double-digit growth rates but Africa stands out with a growth rate of over 40% - twice as high as the global average. By the end of 2014, mobile-broadband penetration in Africa will have reached almost 20%, up from less than 2% four years earlier. Close to three billion people – or 40 per cent of the world population – will be using the Internet by the end of 2014. More widely available information and communications technology networks and services, growing content and applications, and falling ICT prices are paving the way for an unprecedented number of people to join the global information and knowledge society. Two thirds of the world’s Internet users are in developing regions, where the number of Internet users doubled in just five years between 2009 and 2014. In Africa, almost 20 per cent of the populations are online, up from 10 per cent in 2010. In 2014, Internet use penetration in developing countries had grown by 8.7 per cent, twice as fast as in the developed world, where its usage rose by 3.3 per cent. Less than one-third of the developing world populations are, however, online compared with 78 per cent in the developed world. The figures and trends are proof that the digital divide is narrowing. But what is even more important is the fact that information and communication technologies are transforming people’s lives as they impact the eco-system of education, health, commerce, financial remittances, agriculture and the delivery of Government services. Many of the developing countries are adopting broadband plans and some are in the process of huge ambitious projects of rolling out optical fiber to the home. This contributes to the poverty alleviation. We already know that there is a co-relation growth of broadband and the Gross Domestic Product (GDP) of countries. It is estimated that a 10% increase in broadband results in +1.3% growth in GDP. Without belaboring the point, broadband and ICTs in general improve production processes, efficiency and output growth. As the Internet has permeated almost all our human lives and extended to machines (M2M), we may as well start to talk about the Internet of Everything (IoE). So, the rapid growth of the Internet is a good sign for the developing world as a medium to deliver digital opportunities to everyone. Q: With natural disasters occurring more frequently how are you helping on this side? A: Natural disasters continue to wreak havoc across the globe. Some countries are more affected than others due to various reasons that include their geographical location, and their level of development, to name but two. The year 2014 is celebrated as the Year for Small Island Developing States (SIDS). In August 2014 the world converged in Samoa at the Third United Nations Conference on Small Island Developing States with over 4,000 participants. ITU participated in this Conference and concluded a far-reaching agreement with the SIDS in the Pacific seeking to help connect these countries with a project that also brought on board three large satellite operators that are contributing space segment. Party to this agreement is ITSO (International Telecommunications Satellite Organization) with 149 member countries. The project addresses both social development challenges as well as the threat of natural disasters in order to enhance preparedness as part of disaster risk reduction. The same project would also be used for early warning and disaster response. This is important since SIDS are a special case sharing such characteristics as small size, remoteness, vulnerability to external economic shock, and natural disasters, and sea-rise. Some of the SIDS are also the least developed countries which makes the situation even worse when disasters are impending, as their capability to respond is compromised due to lack of resources. However, even huge, well developed countries are not immune to disasters. From its inception, ITU is committed to use telecommunications for saving lives on land, at sea and in the air. This is exactly what we are doing today. A lot of focus is on designing National Emergency Telecommunications Plans (NET) for countries which then become an integral part of the countries’ National Disaster Management Plans. The NETs cover policy, legal, regulatory and technical issues as well as contain Standard Operating Procedures. Assistance is also provided to countries in designing and deploying early warning systems. This may include the use of geographical information systems (GIS) to capture and process high-resolution satellite images and the application of active and passive remote sensing for disaster management. Within the first 24 to 48 hours of a disaster striking, ITU deploys a hybrid of communication systems to the affected countries while paying for the transportation of the equipment and for the usage in the form of airtime or space segment. While on the ground, training for Government designated first responders is carried out and then the deployment commences. This could include research and rescue, medical teams, those involved in food distribution and providing shelter. In remote areas, telemedicine facilities would be established to link junior doctors on the ground with specialists all over the world. Recent deployments have made positive contributions to the work of humanitarian aid in affected areas. These include our intervention in the Philippines following the super Cyclone Haiyan, the Japan Sendai earthquake and tsunami, the Chile earthquake, the Haiti earthquake, the Pakistan floods, Indonesia earthquakes, Uganda landslides and Samoa earthquake, to name but a few. Through the Smart Sustainable Development Model initiative, recently designed and adopted by ITU, there is now a natural linkage between information and communication technology for socio-economic development (ICT4D) projects and information and communication technology for disaster management (ICT4DM). This approach seeks to optimize the use of scarce resources. The infrastructure setup for ICT4D is immediately mobilized for disaster response. The same local population is trained and fully equipped to support their communications when natural disasters are impending. In all this, capacity building is one of the important elements. 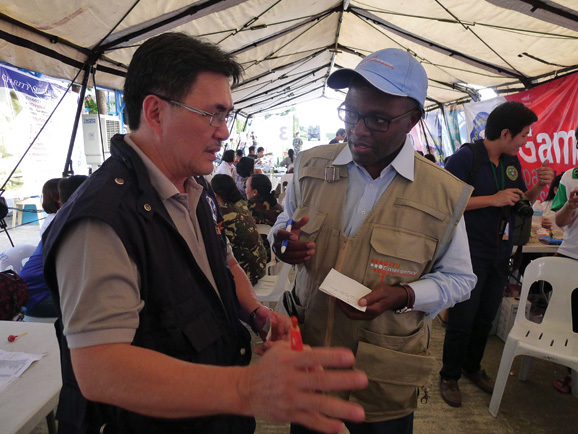 Assisting countries and communities to hold regular simulations and drills is also part of the routine contributing to disaster risk reduction. Human life is precious and losing one person is just too many lives lost. Q: What next for ITU in the coming years? A: For ITU to remain relevant, we have to respond to the needs of our Membership (193 Member States, and over 700 Sector Members). We are coming to the sunset of the Millennium Development Goals (MDGs) adopted fourteen years ago whose Millennium Declaration articulated a bold vision and established concrete targets for improving the existence of many and for saving the lives of those threatened by poverty, hunger and disease. The world is ready to embrace the post-2015 development agenda which is slated to build on the work of the MDGs and integrate the social, economic and environmental dimensions of sustainable development. We believe that information and communication technologies can transform people’s lives. Our future work is not going to be driven by technology, but by what technology can do for people. How can a rural-based midwife help a mother about to give birth do so safely? How can a fisherman in the high-seas feel safe knowing that technology would be at hand to warn him when rough seas and tsunami are threatening? How can a diabetic patient know when to inject insulin, how can a small-scale farmer know when to plant and when to pluck? How can a student find the research materials needed for class tomorrow or participate in a course being run from a thousand kilometers away? How can an elderly mother receive finance to buy antibiotics or food from a child working in another country or another continent without having to wait for days or months for a letter to arrive? How can a disabled person feel normal and do whatever others that are able bodied are doing using communication technologies? This is the challenge that we have and will overcome.